The Royal International Air Tattoo or RIAT as it’s been known in recent years is undoubtedly the worlds largest military airshow event. Fairford has been home to RIAT for many years, where there is always space for the hundreds of visiting aircraft. Every year the show organisers choose specific themes to try and keep variation for the regular Air Tattoo fans. This years themes were, ‘Eyes in the sky’ representing reconnaissance technology and ‘Roar-05’ a NATO tiger meet gathering. This is the perfect opportunity to show off your fancy painted aircraft! Squadrons with a tiger as part of the unit patch have the honour of being a ‘Tiger Squadron’. Although many tiger Squadrons were present only a few aircraft were presented in specially painted tiger colours. Unusual to see in the UK was a pair of Italian Navy AV-8 Harriers. Nice to have the two variants, the single seat and twin stick trainer aircraft. The Spanish EF-18B Hornet belonging to Ala 31 in the static display was specially painted with a tiger on the tail, celebrating a total of 100,000 flying hours on the type. F-16 Fighting Falcon numbers seemed to be down this year, with only Belgian, Danish and Dutch examples in the static. One of a pair of Danish F-16s from Esk 726 had a nicely painted red tail. All four Romanian Mig-21 LanceRs that were on deployment at RAF Lossiemouth, were present in the static display. Staging there way back home, the next stop will be Kleine Brogel in Belgium for the spotters day on the 20th of July. The Mig-21 Lancers weren’t the only Russian built aircraft at Fairford, the Polish Air Force displayed their tiger schemed Su-22 Fitter. The Fitter is similar to the Lancer in design aerodynamically, apart from the the Su-22 has swing wings! Another rare aircraft seen at this years RIAT was an TA-7C Corsair II from the Greek Air Force. Also provided by the Hellenic Air Force was an RF-4E Phantom II, an ex-German aircraft which seemed to still be in German Air Force paint! This year many Royal Air Force aircraft are hosting special schemes. 111 Squadron have one of their Tornado F3 tails painted up in the Squadron colours of black and yellow. Also 13 Squadron also have a Tornado GR.4 with a painted tail celebrating 90 years of the unit. Unfortunately the Germans can no longer participate in Foreign airshow flying displays but they did their best to support Fairford. Providing a pair of Tornado IDS aircraft one from AKG 51 the reconnaissance tiger Squadron and the other from WTD 61. Also a Tornado ECR operated by JaboG 32 Squadron. An F-4F Phantom II from the unit JaboG 74 was also on display. The absence of an American F-15 Eagle in this years flying display was replaced with an F-16C Fighting Falcon. Although its refreshing to see other F-16 units displaying, the American text book routine seemed to be created by someone who had never been to an airshow! Consisting of mainly level passes with the occasional turn or climb. The routines minimum altitude also seemed to be 500 feet. I feel it didn’t show the full capabilities of the F-16C version, maybe the Americans should ask the Dutch Pilots for some tips, for they have always presented the Falcon to the limit of its performance envelope. Besides the large number of participants and themes it is the American bomber (B-1B and B-52H) presence that really makes a RIAT report different from other European airshow reports. Another US aircraft which is not seen often at European airshows is the U-2, which was part of the static show this year again. The Eurofighter Typhoon practice display on Friday will be the talk of some military aviation enthusiasts for many months. During a practice display, Pilot Matt Elliott of 29 (R) Squadron almost found himself eating pieces of grass after the Typhoon became noticeably low while pulling out of a descent. Thankfully he recovered the beast well, Squadron Leader Matt Elliott later admitted it was pilot error. The Eurofighter was re-calibrated and Matt practiced his seven minute routine later on in the afternoon, this time without a hitch. Allowing the Eurofighter Typhoon display to go ahead as planned on the show days. Last years flying programme featured the US Navy's F/A-18F Super Hornet, this year the Hornet spot was nicely filled with a F/A-18C Hornet from the Finnish Air Force. Although the Hornet didn’t do a pass with the gear or even the tail hook down the Pilot from 31 Fighter Squadron put the Hornet through its paces with plenty of high G manoeuvres. Demonstrating the F/A-18C Hornet although being a Third Generation Combat Aircraft, it can still keep up with Fourth Generation flight characteristics. Another well performed flying display was the French Air Force Mirage 2000C. This delta wing designed aircraft is always a joy to watch. Shortly after take-off the pilot throws the Mirage 2000C into a roll, this always wakes a few people up. What a perfect way to make people pay you some attention! An example Mirage 2000C was in the static display from the unit EC 01.012. Making its first appearance in the UK with a brand new paint job and display pilot. The Dutch F-16AM Fighting Falcon Solo display. 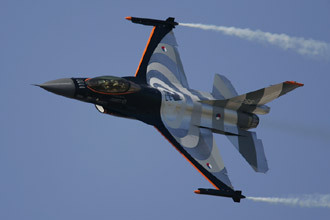 Flown by Gert-Jan Vooren nicknamed “Goofy” the display Pilot for the airshow season of 2005 impressed the crowds with his black, silver and orange schemed F-16. The weather was perfect for the flying displays with the Dutch Viper performing ‘high show’ routines on both Saturday and Sunday. 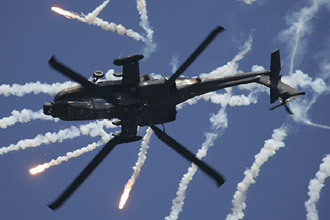 The Second Dutch item in the flying also didn’t disappoint, the AH-64D Apache fired flairs on three occasions, inverted while performing loops. The Red Arrows are well known for unusual formation fly pasts, this year the 9 Hawk T.1 aircraft joined a three ship of Supermarine Spitfires. All three Spitfires carried the black and white stripes of D-Day. On Monday the weather wasn’t as nice as the weekends glorious blue sky had been, in fact it had turned rather cold. We still went out to the field though to catch the metal depart and get some nice pictures of the static aircraft in action. Most aircraft departed one after another but some chose to formate as pairs, which is always good to see. The static Dutch F-16s one belonging to 313 tiger Squadron and the other from 323 Squadron both departed side by side in afterburner! The Royal Air Force Hawk T.1s from RAF Valley departed in a three ship formation. The display Hawk painted with flames on the nose, lead the formation. Its always nice to see four Mig-21 LanceRs arrive one after another but seeing one depart after another in full reheat is something else! So was it worth going? The Dutch F-16 display was great to watch plus the Finish F/A-18C Hornet and the French Mirage 2000C. These displays were very entertaining. The weather was warm with mostly blue sky every day apart from Monday... so all in all it was good if you ask me! All good things have to come to an end. Just like the sun, its time to pack up and go home... Well at least until next year! We would like to specially thank The Royal International Air Tattoo Media Office for their assistance.